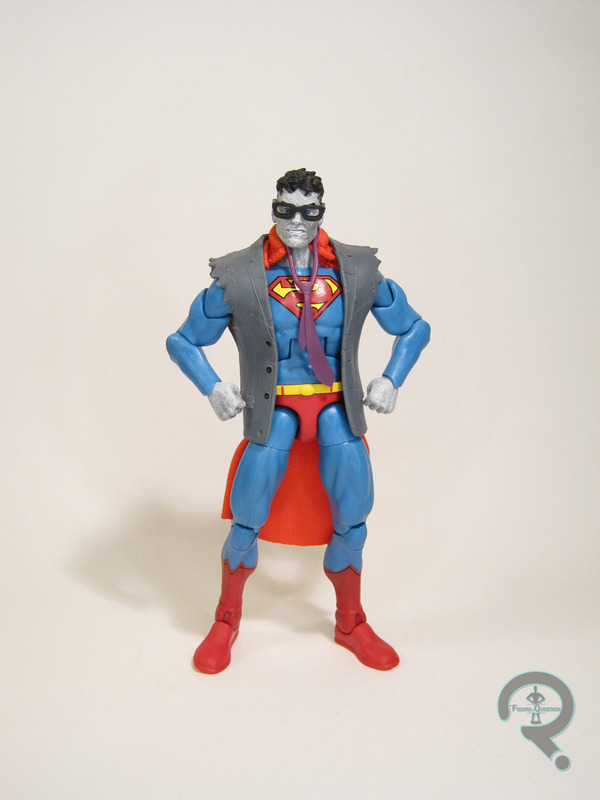 Bizarro is a Walgreens-exclusive release for the DC Comics Multiverse line. He started cropping up in the last couple of months, though he was originally shown alongside the figures that made up the “Lex Luthor Series.” The majority of those figures are modeled on the characters’ “Rebirth” appearances, but Bizarro here is actually a much more classically inspired figure, which was a kind of nice change. The figure stands 6 1/2 inches tall and he has 23 points of articulation. 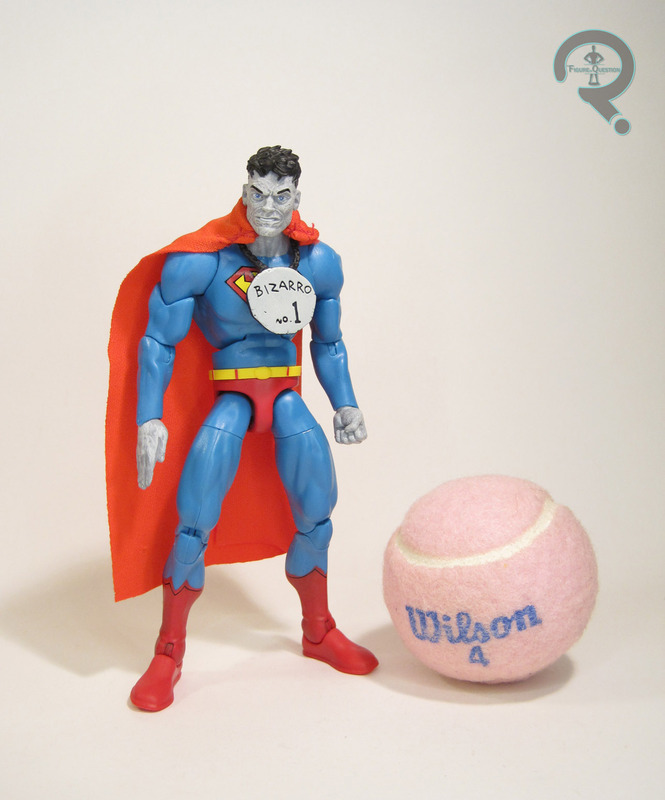 Bizarro, understandably, re-uses the body introduced with the Rebirth Superman figure from the Clayface Series. It shares a more common ancestry with the old DCUC body than the body used for Ray, meaning it’s just not quite as refined. It’s still a definite improvement on the old body, though it feels a little more piecemeal and uneven. I think the pelvis and hips are the part that really throw the whole thing off. Bizarro gets a new head sculpt, which is a pretty respectable piece. It’s appropriately squared off and blocky, and the detailing on the hair in particular is quite nice. Bizarro trades out Superman’s sculpted cape for a cloth piece that connects around the neck. On a standard figure, it would be a little goofy, but for Bizarro it actually works to the design’s favor. His paintwork is overall pretty clean. The colors are nice and bright, and his skin has a nice textured look about it which works really well. Bizarro is pretty decently accessorized. He’s got two sets of hands, in fists and flat flying poses, as well as his signature “Bizarro No. 1” placard. And, if you want an alternate look, well hey, he has one of those too! You can give him his Kent Clark guise from the comics by adding a pair of glasses, a tie, and a rather raddy-looking jacket. As a bonus to this look, the use of a cloth cape means that it can fit under the jacket and stick out like it does in the comics. It’s a fun extra look and adds a real unique touch to this release. I was moderately interested in this figure when he was shown off, but wasn’t 100% sold on it. After picking up and being quite impressed by Ray, I found this guy while out on a day trip with my parents and my brother, and was actually pretty happy to do so. While he’s not quite as strong as Ray, he’s still a lot better than Mattel’s output has been for a good long while. I am again frustrated that they managed to improve things just before losing the license. But hey, at least I got this cool Bizarro figure.